Good morning! Wow February was a busy and exciting month for us here at Little Miss Muffet Stamps! We hope you enjoyed seeing all the fabulous new Paris Release images! We have a new challenge for you this month inspired by our very own Leah Ann. 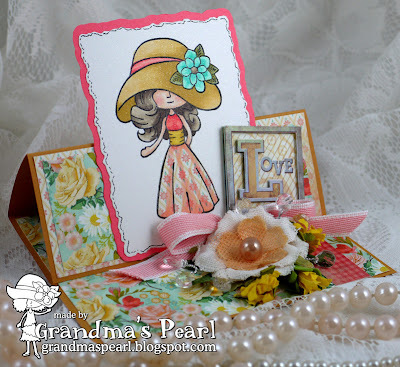 She always makes such beautiful easel cards, so we decided to have a challenge for you to make an Easel, Shaped or Step Card. You don't have to use a Little Miss Muffet stamps image, but if you do then you can submit a project with the theme Anything Goes. We always love to see your Little Miss Muffet Stamps projects! Aren't they gorgeous?! It was certainly a challenging challenge for me, having never made an easel card before! Isn't it fun to step outside your comfort zone every now and then and challenge yourself? We really hope you can join us for this challenge. The rules are on the side bar, but briefly:Our challenge to you this fortnight is to make an Easel, a Shaped or a Step card (or if you use a Little Miss Muffet stamps image you can submit using the theme Anything Goes).This challenge runs for just about two weeks. Please leave a link directly to your card using the Linky below.The winner of this challenge will receive 2 or 3* digital stamps of their choice from the Little Miss Muffet stamps shop (*if the winner chooses to join us as our guest for the next challenge they get to choose a third image to play with). Awesome challenge I love easel cards, and gorgeous work by the design team. So inspired. Thank you for spotlighting me in the last challenge. I am truly honored by that. Leah Ann, you certainly inspired me. Thanks again for the blog candy which I am enjoying, as you see. Beautiful cards ladies, lovely cards! I made an easel drawer box, I hope this qualifies. Thanks for a great challenge! What wonderful samples by the DT!! A fun challenge! Thanks for the fun challenge! The DT samples are absolutely gorgeous! Lots of inspiration here! Awesome work by the DT, the samples are just fabulous!